The fryer worked like a charm for almost 7 months. Then, as many other reviews have mentioned, the right side quit working. Tried resetting. Even tried a different outlet with no luck. Can anyone help with this issue? Worked great for six months and 13 days. Then one side stopped working and its only a six month warranty. Customer service was unable to help. Buy at own risk. The right side of this fryer was defective which was not fun for our offsite event that needed fried chicken. The baskets were also smaller than I anticipated. Working with Webstauraunt to rectifiy the issue. We've been using this fryer for years to fry any and everything that can fit. It maintains the temp pretty well if you don't crowd the fryer and reaches a temp of about 350F. It shows clearly the min/max fill line for oil and has a display to indicate when the fryer is hot and heating. It is tough to clean the heating unit sometimes, but if you are careful and have the right tools, very doable. Great little fryer for the price. Recovery time is sufficient for small operation. Love that it's easy to break apart and clean. Would definitely recommend for small restaurant with low fryer volume. Double fryer 120V, 3500W. I bought this one for home and it is very good fryer. If you keep up with clean fry oil it will fry some very good and tasty food. Deep baskets allow for plenty of items to be cooked at once. Takes a while to heat up, but nothing major. I would consider buying 2 single tank fryers vs this dual one in case your electrical connections require flexibility. Overall great product. Have a few of these. They heat up fairly quickly. I only use them for catering and for the price they are well worth it. This Dual tank fryer is great we like the fact that it is countertop and electric, so we don't have to worry about any special installations, just hook it up anywhere and you are good to go! Great for outdoor events too. Avantco dual tank electric counter top fryer good for busy places or restaurant & deli . Its time saver , easy to use comes with all the attachment using this item everyday . We use this to cook 2-3 servings of chicken or fish at a time - one side is dedicated to fish/seafood. Have been using daily for about 6 weeks, it usually sits on low heat for about 5 or 6 hours a day, we raise the temp as needed for orders. (Fries are done in a full size fryer.) Have had absolutely no problems & it solved a major space issue. We use this product every time we are open. The product is easy to clean and makes the load on our other fryers smaller. When we are in a pinch we use this fryer in order to stay caught up. This fryer is perfect for the small kitchen looking for a way to easily expand menu. The 2 bays hold oil temp very well and is relatively easy to clean. This product was a huge let down. We bought it because we do very light frying 12 donuts a day and 20 cannoli's a week. It would not reach temp, the hottest it would get is 200 degrees. I returned it for a full refund and bought a different brand. We bought two sets of this, and we had plug it in every day since 8 minths ago for 13 hours oer day, we has no problems so far, they heat up fast like about 10 to 15 minutes to 370 f, for the price its a great product. This fryer is awsome I have enjoyed cooking with it. It is not made for large scale frying but is great for med to small size events and frying. Sorry to say but the box which came had been ripped open and was damaged at few places. If you had sent a sealed box how come it is opened and damaged. I can be reached at my email on record. This is a great product, but I would only recommend using this fryer in a low volume setting, they lose temperature when used in high volume. Solid product for the price. Better than anything you can get at a big box store but don't expect the same recovery time and build quality of one that costs 5x as much. Cooks fries and appetizers fine but for fish it's better to get a better built fryer that can recover faster and hits a true 375 degrees. This fryer works great! I agree with many of the other comments though about the handles on the baskets. They do not stay in place. I found a fix though. If you bend out the bottoms of the handle and run the handle "around" the opening instead of through it, and they bend the bars back, it is a solid fix and they work great, the down side is you will not be able to fold them over at night, it is a permanent position for the handles. The unit heats up in about 20 minutes. WE do a full bag of fries (6 bags to a case type) in about 14 minutes it yields us about 12 orders. This is a good light use machine, I wouldn't want to use it 10 hours a day 7 days a week. AS always I was satisfied with the price paid and the quick shipping. It took care of our needs for a high school foot ball game on a Friday night and will do so for years to come I'm sure. The temperature control works well and the dual tank provides adequate space and is helpful when frying foods separately such as egg rolls and desserts. The only drawback we have found is that the basket handle will sometimes fall out of place, so we try not to shake the basket. Other than the basket handle, this countertop fryer does the job. the unit does heat up and fry, that said, it is very hard to clean, the materials are cheap and it has a bad design. The baskets are nice, but the handles are silly and dangerous. It overflows oil all over even when filled to the lowest fill level. No switch so you must unplug it for safety. Plus this one was received with a bent element. So far, I have not been able to get any help with it. avoid this product. I was skeptical about the size for my small restaurant/catering business. However, it is the perfect fit!! Definitely worth every penny and is efficient even during busy periods. Planning to get another one for off-site events. Good product. We use it (plus the single pot model) for items that take 3-4 minutes to fry. It stays on for about 4 hours/day and has been used for several months with no problems. Small restaurant with a limited fry menu. This fryer is good for cooking fries. The capacity isn't huge but I still only use one side at slower times and start the other side once i gets really busy. If your volume is small this is excellent. Fantastic Little Fryer. I use it all the time in my Diner for Fish and Shrimp. It has come in very handy as a backup and overflow fryer as well during busy times. Great buy for the Money ! Works as advertised in my opinion. I use this deep fryer for home use and the Dover Sole fish I fry comes out just like the restaurants I visit. Just make sure you're cooking at 365 F. I highly recommend this deep fryer. When space is limited this is the perfect unit if you plan to still deep fry items. Easy to fill and use. Great for small spaces and a great item for appetizers. Great small fryer for any home kitchen or any small restaurant that only has a few fried items on the menu. Also gotta love the price for such a sleek small fryer with a splash top. Great fryer and the two cords is extremely helpful. We do a very small amount of frying in our kitchen so its convenients compared to a whole fryer. Did not last a full year. One burner went out and then the other. Probably a good product for light use. Definitely not heavy use. 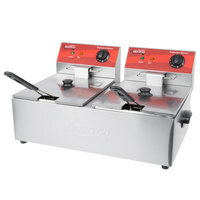 The Avantco 20 Pound Commercial Countertop Fryer with Twin Pots 120V. It is great each side das it's own cord so they can be set a different tempatures. It is perfect for concession stands. The Avantco 20 lb. Commercial countertop Fryer - Twin Pots 120v. It is great for our concession stand. The fryer baskets and lid for overnight are included. You can use one side only if needed, cause each side has it's own cord. I love this fryer! Keeps temp really well and allows to cook dozen wings without crowding. They cook up nice and crispy! Only wish is that it had a timer attached to it. Great fryer that keeps the oil at an even temperature which helps keep a consistent product. I would recommend this to all small delis and restaurants. Ok, so I love this fryer. I'm a small deli with limited work space. I can use one side for french fries and the other side for coated buffalo chips, excellent for my business. When I first opened the deli, i was only serving fries so i would use only one side of the fryer and once it got dirty, i would use the other side until both sides were dirty and then i would clean it. Definately recommend this fryer! A little smaller than expected but it works very well. I recommend for a backup or quick fix to any fryer needs that you might have. Very Good product, just received so have not had much time to use. But, all the products we have bought from Webstaurant Store have been very reliable. Fantastic little fryer, we use this on a regular basis for our off site catering. Recovers very quick and holds consistent. Will buy another soon. This fryer is the best for the money you pay, I love it. It is very economical very light and good looking as well as compact. It is a good one. Outstanding fryer - we use for promotional tailgating events - it handles the load with easy. The thing I like the most is the easy clean up. I would recommend this product for anyone who likes or needs to fry food. Excellent purchase! Allows me to fry chicken or fish for my catering business without mixing the oils. You can either use one side or botth sides together. Heats up withing 15 minutes and you can also purchase the filter powder to clean your oil to be reused. A must buy for small business owners! This is very easy to work with on the counter at home. We got it as a testing fryer at home when we don't want to load oil into our large commercial fryers. The temp range is accurate to our large fryers and gives us a chance to test new products in small quantity befor adding to our menu. I am a caterer and purchased this for a big in store event that my company catered. It is awesome! We did french fries for 175 people in an hour. It was easy to use, quick to come up to temperature and easy to clean because all the pieces come apart. The ONLY little problem is the handles on the baskets, which someone else mentioned here. For the price though- you absolutely can not beat this thing. Get one! This deep fryer was the most economical that I could find; and I am so happy that I did. I love the dual wells with separate temperature controls. We do a small fried menu and this fryer heats up fast, maintains temperature well, and provides for easy cleanup. The only disadvantage is the lack of timer(s. This is highly recommended for small cafes and restaurants. This is the best price I ever found on the 20 lb Countertop fryer with twin pots at 120 v. It heat up very quick and it works just well like all the other expensive one. Got it for my mom, she loves it. This fryer is great. The heatup and recovery time is excellent. Its easy to clean and Maintain. I looked around for quite a while and found this one to be the most reasonably priced and most reliable. I would reccomend this unit for anyone looking for a nice compact table top electric fryer.